The mission of the Taos County Economic Development Corporation since its founding by Pati Martinson and Terrie Bad Hand in 1987 is “Supporting food, land, water and the cultures of the peoples of Northern, New Mexico,” and these two ladies have been working tirelessly for decades to achieve this. Despite being a beautiful tourist destination that attracts some of the richest people in the country, per capita income in Taos County still hovers around $20,000 a year. There is a division between long time residents (like the Taos Pueblo who have been there for over 1000 years, and the Hispanic community who settled in the area 500 years ago), and newer wealthy retirees from the East and West coasts. Most business in the area is related to tourism, and much of that income does not go to locals. Pati compared Taos to island economies; based on the beauty of the area, and isolated due to a lack of highway, rail, or airport near town. 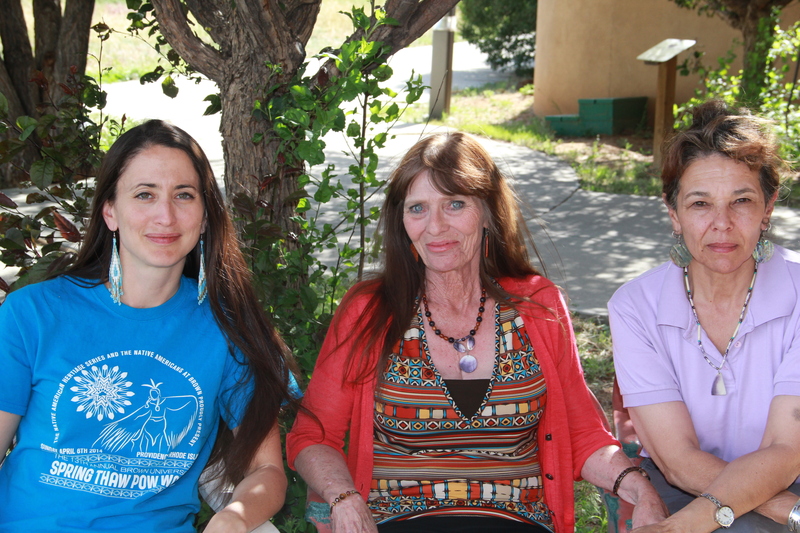 The goal of TCEDC is to serve the marginalized and minority communities in Taos, and they describe their work as “multicultural and intercultural.” I first met Pati and Terrie at the First Nations Food Sovereignty Summit in 2013. One of my former Brown students, and Native food revolutionary, Dana Eldridge (’05, Navajo) turned to me after introducing me to these ladies and beamed. “They’re my heroes,” she said sincerely. After hearing their story and touring the Taos Business Park, I can see why. Pati and Terrie first met at the Denver Indian Center, and have since worked together under a shared leadership model for the past 33 years. They work in a 24,000 square foot business park, but share an office, and finish each other’s sentences. They bring a diversity of experience to this team: Terrie is Cherokee and Italian, originally from Boston, and Pati is Lakota and French, from rural South Dakota and Nebraska. In 1986 they left their jobs in Denver when they were invited down to Taos Pueblo to establish an economic development project. Unfortunately they arrived just as the tribal government was turning over, replacing the administration that had extended the invitation. 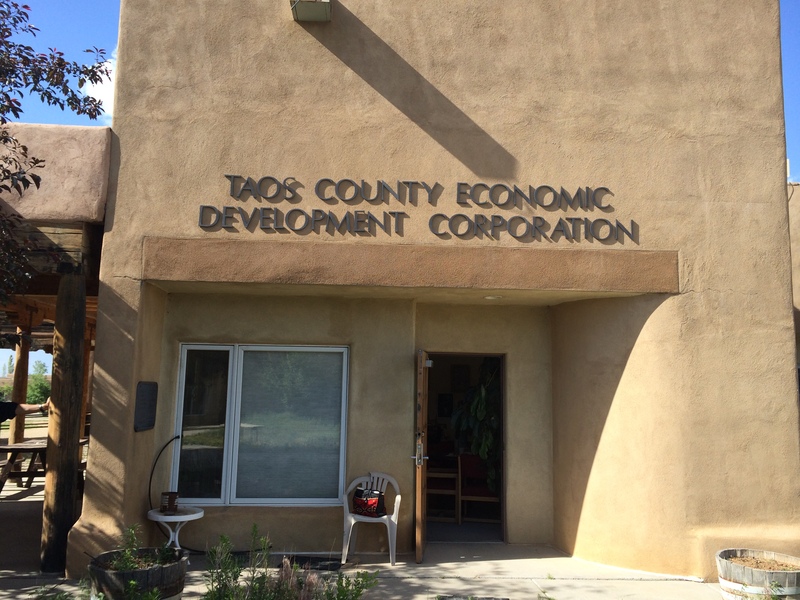 As they scrambled to find employment to support their families, they learned that Taos County was looking for an executive director for the business council, so the ladies gave the county “an offer they couldn’t refuse” as Terrie described it—to work as co-directors and split the $12,000 annual salary. The two of them created a business incubator, taking an old Smith’s grocery store and building stalls inside for individual businesses (Pati described climbing into a puddle jumper, flying up to the Smith’s headquarters in UT and convincing them to lease the building for $1 for 15 years). The incubator helped people to move from their driveways into their own jewelry, tinwork, woodwork and upholstery businesses. The ladies also tracked down every federal and local program who claimed they were serving the business needs of the community, and put them to work. 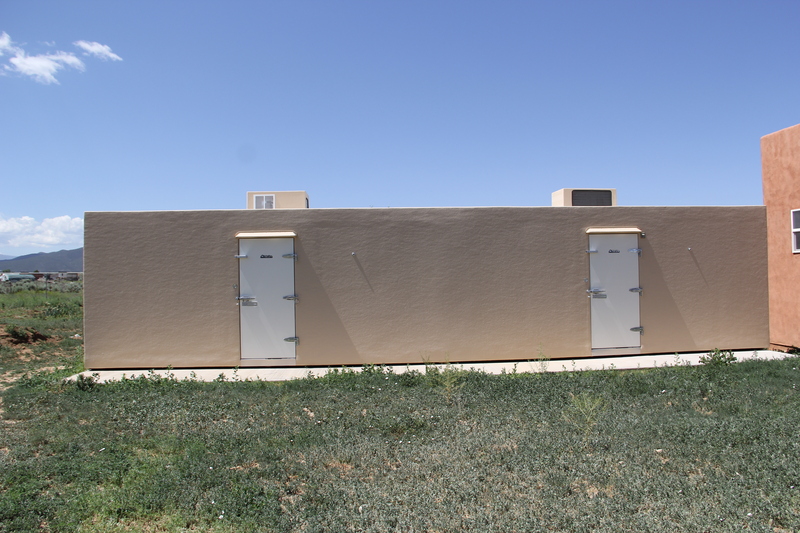 They developed a board of directors for TCEDC, comprised of representative from Taos Pueblo, the county and the town, as well as 4 at large members.But the one thing they couldn’t support in this building was food, which was something the community saw as critical. Terrie and Pati visited the commercial kitchen at Spokane community College, and decided to use this as a model for their own community. Regulators had hit Taos, putting street food vendors out of business, and so Terrie and Pati decided to build a food center, which would provide the USDA approved kitchen and training these cooks would need to stay in business. The 6 acre site was donated by a local resident, and they worked for three years to assemble the funding necessary to build the 24,00 square foot business park with a 5,000 square foot commercial kitchen, which was established in 1995. Much of the space was rented out to artists and youth programs, with the rent money sustaining the kitchen. Since the recession TCEDC has had trouble filling all of the available spaces, but just a few weeks ago the Taos Integrated School of the Arts charter school agreed to lease out a majority of the park, which will provide some financial stability to the Center. 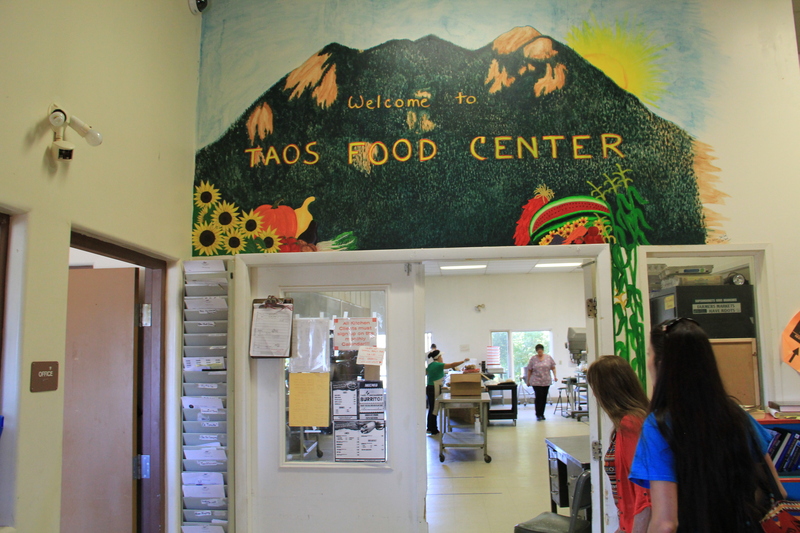 The heart of the Taos Food Center is the 5,000 square foot commercial kitchen, which is rented out to individuals and businesses who complete a set of courses. The Food Sector Opportunity Project began in 2000, and provides technical training necessary for food processing. The core of the project is a week-long 30 hour class covering all the basics of food processing, from the history and culture of food in Northern New Mexico to microbiology and food safety. The course also covers basic small business skills and computer skills for food entrepreneurs. Now when regulator catch people selling out of their homes or on the street, they send them to TCEDC for training. The courses also create supportive peer groups, and let regulators know who to expect selling in town. The kitchen is open 24 hours a day 7 days a week on an honor system, available to anyone who has gone through the training. People with food carts, catering businesses and those who sell to local businesses and the farmers market all sign up for kitchen time, in addition to the cooking classes for WIC mothers and local school kids. Up until 3 years ago, it was $9 an hour to use the kitchen, and Pati and Terrie described how it broke their hearts to have to raise the cost to $12 an hour, but they still have difficulty paying the electric bill and insurance. People have suggested that to be self sufficient, TCEDC should charge at least twice what they’re currently charging, but they recognize that this could squeeze small producers out of business. On the day we visited, Matt’s Bakery was making gluten free cookies (we got to sample some amazing quinoa and chocolate chip cookies), and Antonio’s Salsa (which was also really delicious) was wheeling boxes of tomatoes around the kitchen.People who go through the classes also tend to source locally, including produce and a local heirloom variety of Sangre de Cristo wheat. Even the quinoa for the cookies had been sourced from Colorado, but droughts and early and late freezes has led to two years of crop failure. 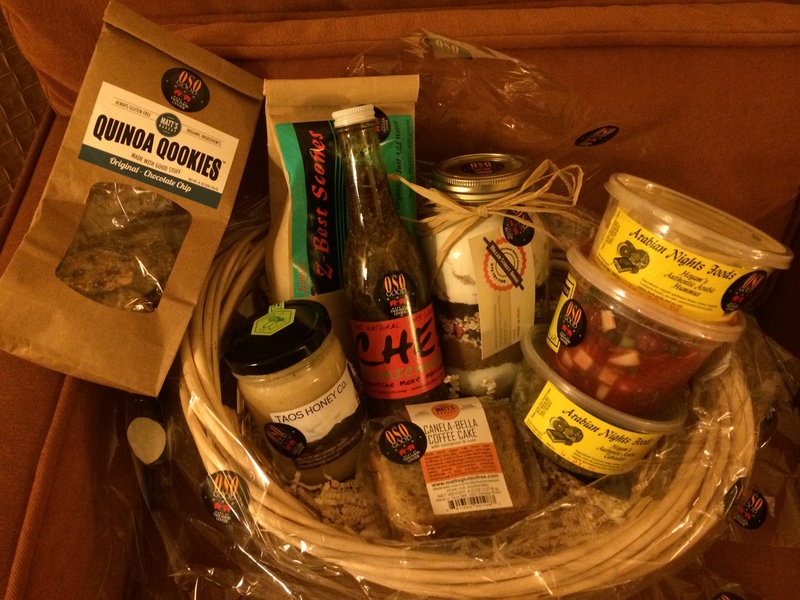 Once the food is prepared in the kitchen, it is labeled with the Oso Good Foods brand, and delivered into town via the Food Center’s delivery truck. Existing businesses and new graduates of the program worked together to create a logo, slogan and marketing plan for a cooperative marketing campaign called “Oso Good Foods.” In addition to sounding enthusiastically tasty, Oso is Spanish for bear, and represents all of the bears that roam around the mountains near Taos. The marketing campaign includes “Oso Good” stickers for all products of participating businesses and special “Oso Good” display shelves at local retailers. Outside of the Food Center is a community garden and two greenhouses. With one of the shortest growing seasons in New Mexico, the greenhouses help local programs extend their growing season. 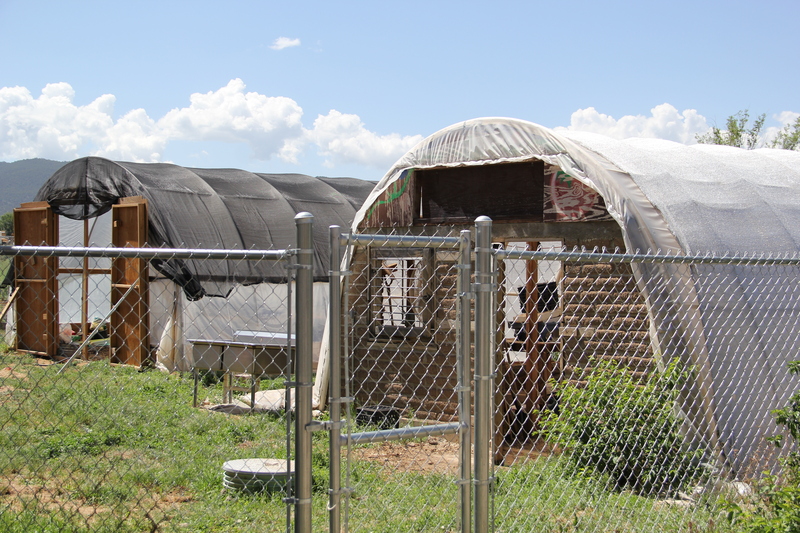 TCEDC’s greenhouse includes an innovative water catchment and distribution system and utilizes affordable materials (like adobe and PVC pipe) that area farmers can copy. 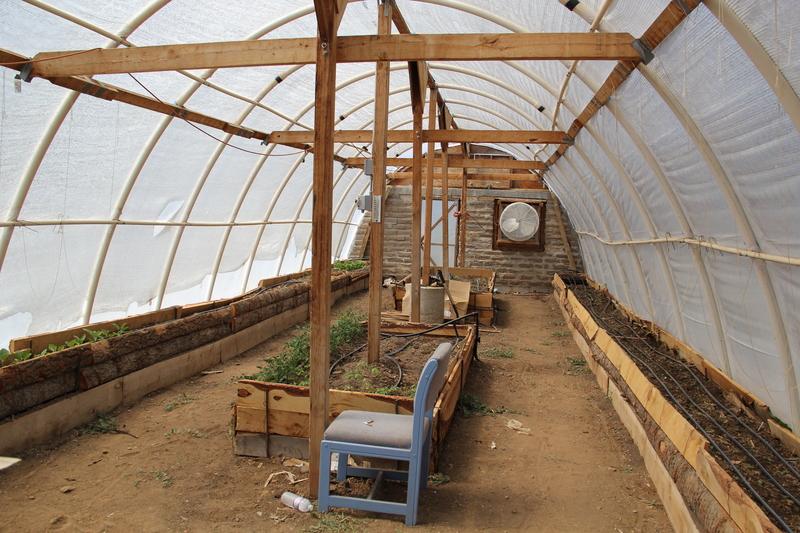 Once used for a variety of programs (many of which have been cut because of lack of funding), the greenhouses are currently being used by the Not Forgotten Outreach program for veterans. Raised beds were built at waist height in order to accommodate gardeners in wheelchairs. 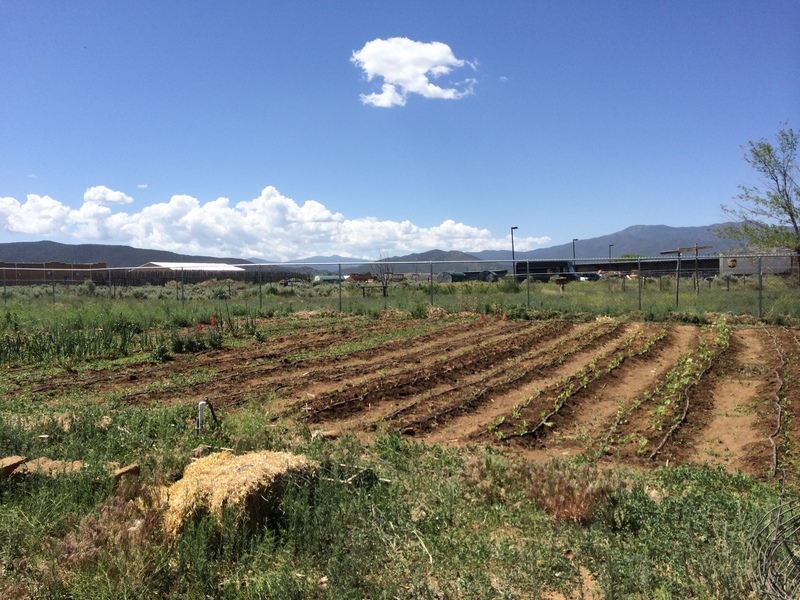 The adjacent garden is currently being utilized by a family owned business led by Garden Coordinator Shirley Trujillo (Taos Pueblo) called Lettuce Grow. Ensueno (previously Association for Retarded Citizens) also hosts classes in the garden and food center to teach their participants about nutrition. One of the land-based cultures that TCEDC is seeking to support is ranchers. In 2006 Terrie and Pati saw a mobile matanza on the San Juan Islands in WA and decided this would be an excellent model for their own isolated community. The mobile slaughtering unit allows the butchering team to go directly to the farm or ranch “and the animal gets to die in the same beautiful place that it was raised,” as Pati described. This means the animal doesn’t have to undergo the stress of transport to a slaughter house. Gilbert Suazo Jr and Juanice Romero from Taos Pueblo are the team who currently operate the matanza. They use a stun bolt to kill the animals because it’s the most humane method (although wilder animals like buffalos are shot because they will not allow you to creep up on them with a bolt.) After the animal is brought down, it’s bled out and then brought into the matanza where its head is removed and it is eviscerated. The USDA inspector will then examine it for health, checking the lymph nodes and liver. The animal is then hung, skinned, and given an acid wash of apple cider vinegar to kill any bacteria. The carcass is then hung in the cooler inside the matanza and transported back to the TCEDC Hang & Age and Cut & Wrap facility. They can fit up to 8 cows in the matanza, and will travel up to a 100 mile radius. 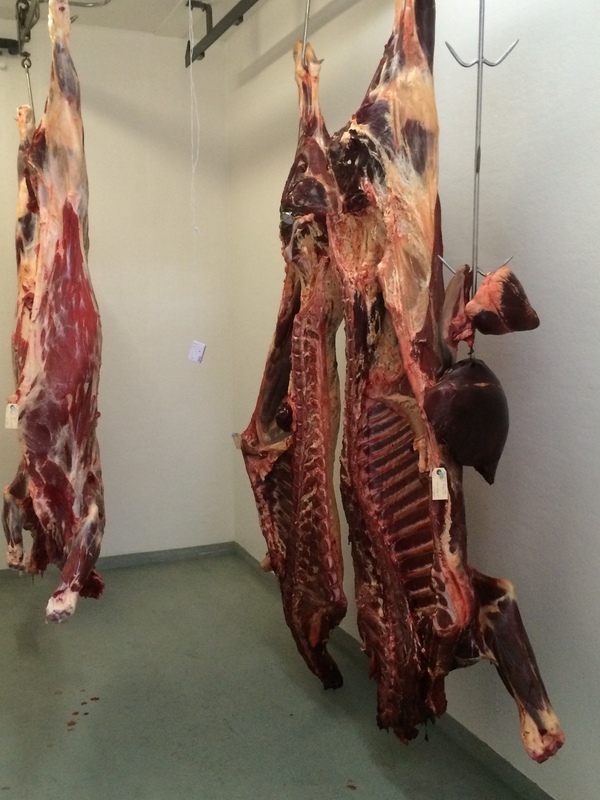 On the day we visited, Gilbert and Juanice were off butchering farm raised elk, about 40 miles from Taos. The day before they processed buffalo that will go into the school for the summer feeding program at Taos Pueblo.TCEDC has received a number of requests to travel all around the southwest with the matanza, but their limit is a 100 mile radius from Taos. 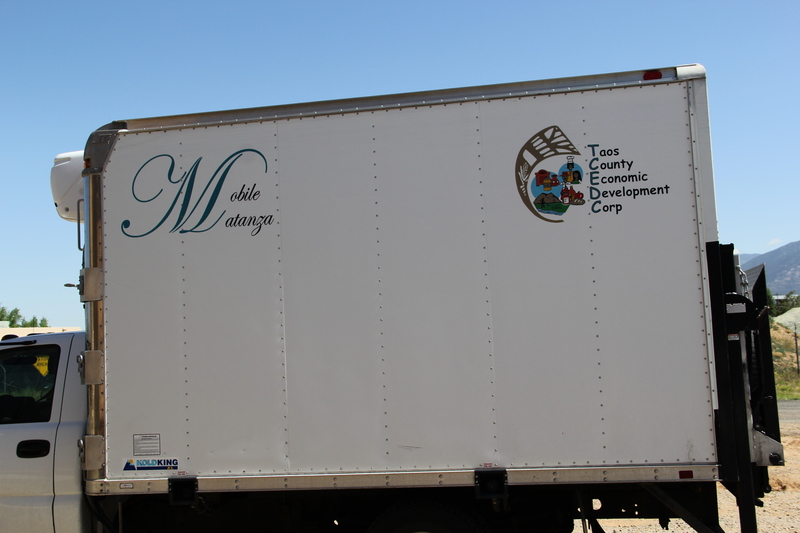 They’re hoping that other communities will pick up the idea of a mobile matanza and establish others throughout Indian Country. A community can set up a mobile processing unit and cut, wrap and age unit for $3-400,000, as opposed to a slaughter plant which costs at least $2-3 million. Adjacent to the Cut & Wrap & Age unit, TCEDC has a 400 sq foot freezer and refrigerator that will some day serve as storage for the future Farmers Market. They had planned to open the market last year, but funding has not been available. They currently have an intern, Tiana Suazo (Taos Pueblo), who is working on the business plan for the market. The idea is to make fresh local produce available to residents all week by purchasing from local farmers (especially produce that doesn’t sell during the weekend farmers market), selling some of the meat from the matanza in family size portions (rather than the ½ or ¼ animal that ranchers usually sell), and to sell products from the Food Center. The hope is to make the market somewhat sustainable but still affordable to local residents. Helping residents with the absolute labyrinth of regulations that need to be navigated in order to legally sell food has been one of the jobs of TCEDC. Nine separate entities regulate the Food Center, including USDA, FDA, the Environment Department, Weights and Measures, the Dept of Transportation, (APHIS animal plant health insurance service (USDA)). TCEDC had to build separate office for the USDA inspector, all of whom require a separate bathroom and a place to keep locked files. With the passing of the Food Safety Modernization Act (FSMA), the FDA is now under Homeland Security. (Check out this article by Adae Romero about the impact of new food safety measures on tribes).The FDA inspector who comes to the Food Center now demands to be called Lieutenant, which was a sudden change for them. Due to GAP (Good Agricultural Practices) safety standards, the inspector made them build a $7,000 fence around the garden, and they now have to install a separate vegetable washing station and hand washing station (even though the bathroom with sinks is a few steps away). The inspectors also made TCEDC put a chain link fence around the wellhead to protect it from terrorists (although Pati and Terri argue that it was safer from tampering before, covered in sage brush, where no one knew its whereabouts). Another new requirement is that all ingredients used in the commercial kitchen that are not grown in the US (for example cinnamon) have to be registered. The mobile matanza and cut and wrap has a HACCP (Hazard Analysis and Critical Control Point), standardized process for handling meat to prevent food borne illness) that takes up 2 huge binders. Many ranchers, gardeners and individual food producers do not have the time or the money to navigate and satisfy all of these different regulations, even if they are practicing good safety standards, further demonstrating the importance of an organization like TCEDC. 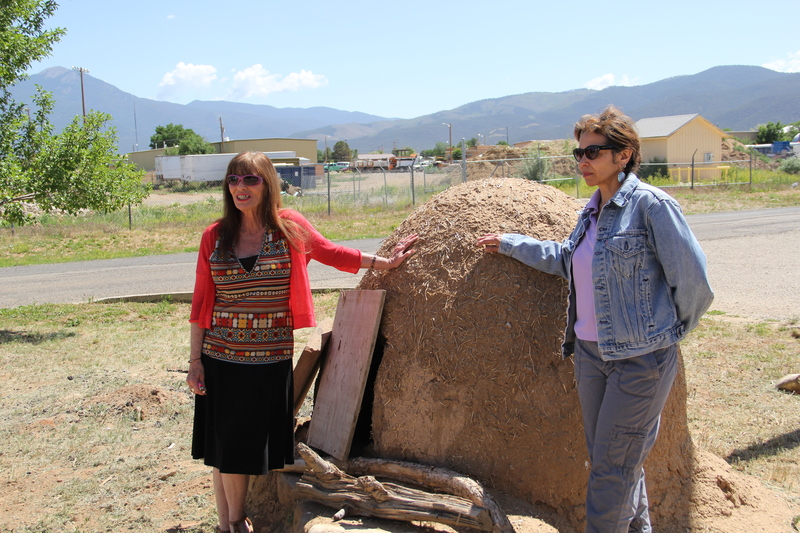 In addition to running the TCEDC and promoting the food system in Taos, Pati and Terrie are currently leading the Native American Food Sovereignty Alliance (NAFSA), which got its start in 2012 when TCEDC received a grant from the First Nations Development Institute. 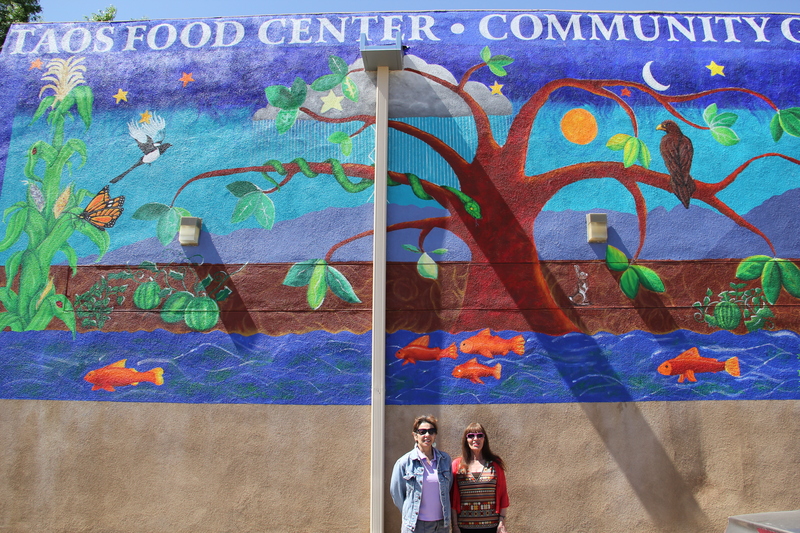 As long-time organizers in the native food movement (they received a peer-mentoring grant from Oxfam in 2000 to bring together Native food organizations), Pati and Terri were obvious candidates to organize NAFSA. 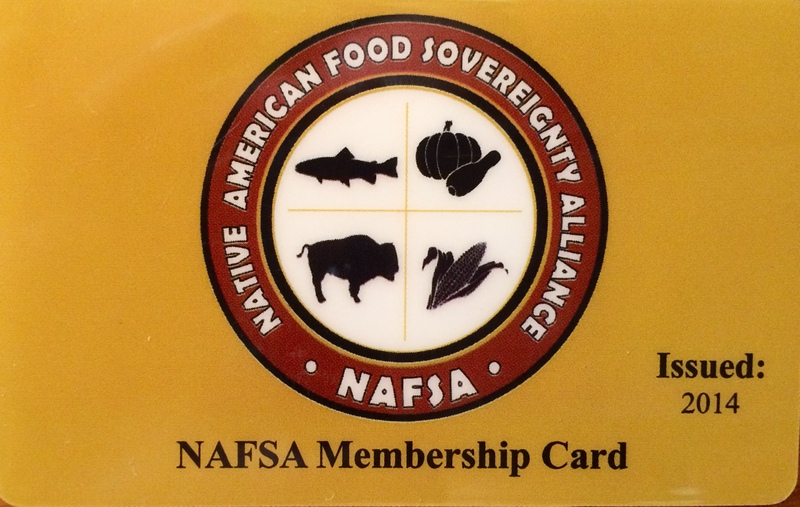 The intention of NAFSA is to support indigenous communities in restoring their food systems, in order to reclaim self-determination, wellness, culture, and their economies. NAFSA brings together individuals, communities, organizations and tribal governments to share and promote best practices and policies to enhance and create awareness around Native food systems. The NAFSA founding council (which include many of the organizations we’re vising on this trip, like Tsyunhehkwa, TOCA, Mvskoke Food Sovereignty Initiative, Traditional Native American Farmers Association, Cochiti Youth Experience, Cheyenne River Youth Project, White Earth Land Recovery Project and Kanenhi:io) met for the first time in October during the First Nations Development Institute’s LEAD Conference, and again in April 2014 at the Food Sovereignty Summit. Pati and Terrie have also been working to sign up members, and currently have about 200 recruits. NAFSA has registered for a 501c3 through the Navajo Nation Economic Development Corporation, will then work towards NGO status with the United Nations. Despite the fact that TCEDC has helped thousands of people over the past 28 years, acquiring enough funding to maintain the operation has been challenging. Pati and Terri, as well as other well-established projects that we’ve visited, described how foundations are less interested in supporting long-running projects than they are in giving money to new up-and-coming projects. Pati and Terrie continue coming to work every day, applying for grants and helping community members even though they haven’t been paid since October Many of the grants they do receive cover equipment, but not salaries. Something that foundations need to consider is investing in the people who organize these programs and put this equipment to good use.